I couldn’t even watch one whole episode. The first season of the new Marie Kondo television series, Tidying Up with Marie Kondo, dropped on Netflix this week. Obviously, Netflix timed this premier to capitalize on our New Year’s ambitions before they fade into Februarian disappointment. The beloved “Japanese tidying guru” was no doubt destined for reality TV as soon as her 2014 book, The Life-Changing Magic of Tidying Up, hit the bestseller list. (The subsequent book is also a bestseller, and a third is on the way.) As a neatness evangelist, she continues to garner “Konverts” even among the reluctant and skeptical. Who can resist that wholesome high created by purging one’s home into total neatness, a sensation known as Kondomania? I have not read the books. I watched the first episode out of curiosity, hoping to understand what all the fuss was about. In classic reality makeover show style, the episode begins with a couple in crisis: their messy home causes stress in their marriage. Then Marie arrives (with her translator—her English is limited), and the magic begins. She explains and demonstrates her method for purging, tidying, storing. This involves famously persnickety ways of folding socks, t-shirts, and jeans. It means going through every item, touching it (this is crucial), and keeping only items that “spark joy.” One bids goodbye, with a ritual thank-you, to all items that do not meet that standard. And then: one’s life is transformed. That’s the idea anyway. During the long middle section of the episode, the couple struggles to follow these instructions and achieve neatness sanctification. We watch them tackle closets, kitchen drawers, bookshelves, the garage, touching items one at a time and waiting for joy to spark. That’s the part I got bored with. So I fast-forwarded to the end, to the “reveal.” Why watch the whole tedious process when I can skip to satisfying footage of a newly tidy home and the couple’s quasi-tearful testimonies of renewed marital harmony and happy resolve to live this way forevermore? I’m wondering about my own impatience here. I have nothing against the show or Kondo herself. Kondo is an intriguing figure with a great deal of practical wisdom. She has turned an obsessive temperament (I say that with respect) manifested from childhood into a vocation that serves others. Good for her. And she’s clearly hit a nerve. New York Times writer Penelope Green admires that Kondo “dispenses benedictions, not judgments.” Bethany Keeley expresses her appreciation for Kondo’s gentleness and her emphasis on joyful relationships with people and objects as the goal of her method. 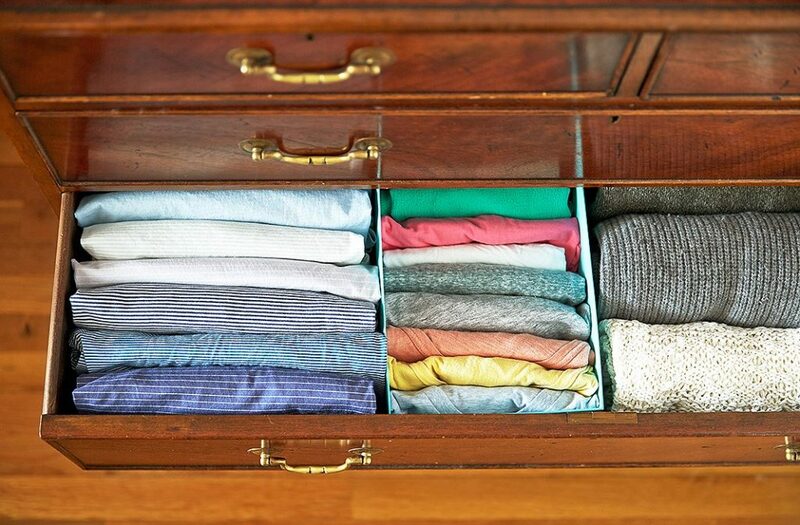 Kristin Du Mez thoughtfully recounts her own experience with the KonMari method on this blog in 2015. You can read Kondo’s books of course, but the television series may be the best way to experience her method, because you can watch her in motion, physically interacting with spaces, kneeling on the living room floor, eyes closed, to greet and thank the house, crawling right into closets to feel their full potential. As a small, beautiful Japanese woman who dresses in prim skirts and moves with precision and intentionally, her manner reads in an American context as girlish, playful, even gleeful. Because of her joyful spirit, she comes off as exacting without being a neatness nazi. Another blog, written by a Christian homeschooling mom, warns that Kondo was a “Shinto shrine maiden” for five years (is that a thing? ), and that putting faith in a tidy house is an empty lifestyle. However, this writer goes on to quote Augustine (“all truth,” etc.) and register enthusiastic approval for practices that are not only pragmatically effective but also promote gratitude. Other Christian writers make the sorts of generous and sensible Christian translations of Kondo’s approach that one might expect: neatness is not salvific, we can’t idolize a perfect home, but we do have too much stuff, minimalism has much to commend in the Christian life, getting rid of stuff builds appropriate detachment, neatness enhances hospitality, how about Matthew 6:19-21, we should be more grateful. And so on. Was my impatience, then, a signal of my resistance to letting go of things? I don’t think that’s it, either. During the opening segments of the show, I was fascinated by and impressed with the psychological wisdom of Kondo’s picky insistence on following her plan. Heaping all your clothes on the bed before sorting is indeed a strong object lesson in You Have Too Much. Saying thank you to objects before you throw them out or give them away, while it might seem silly, could also serve as a useful practice for getting over the grief of letting go. I’m more skeptical about the whole “spark joy” standard, as that seems a high bar, and it assumes a certain level of affluence. Fortunately, the show is not about buying fabulous new furniture or spending wads on redecorating. But if my dinner plates, say, don’t “spark joy,” and I can’t afford new plates, then what? Anyway, I’m all for purging, and sometimes I actually do it. (Alas, though: my basement storage room! Eesh.) My only resistances are time and guilt. I simply prioritize spending time on other things, and I feel guilty about where my discards will go. A landfill? A thrift store? Thrift stores are not always the virtuous solutions we wish they were. I think, in the end, my inability to watch the whole episode was simply a response to the fact that the middle part, however vital to a healthy life, is hard and boring. I was thinking about this makeover-show story arc during a conversation yesterday with a group of new faculty at Calvin College. We were talking about legacy. How do we grapple with the complications of the past: the past of our institutions, our ethnic groups and families, our nation, our churches? For us at Calvin College, we grapple with the complex legacy of John Calvin himself, of the Reformation, of Dutch cultural roots. And I wondered: what if we could sort through our legacy Marie Kondo-style? What would that look like? I want to get right to the end, where we have successfully said our ritual goodbyes to all that we should leave behind, where we’re left with only those aspects of our past that spark joy in the present. Where we have all the most beautiful aspects of our heritage propped up in metaphorical drawers so that guests can coo over how lovely it all looks and how peaceful and harmonious our space feels. But I suppose in every institution, family, nation, church, that middle part is where we live every day. It’s a mess. We’re reluctant to let go of stuff, because should we get rid of it? and if we do, where will it go? and is “forgetting” the bad parts the right approach? It’s tough because we know we may never get to the “big reveal”—until the Big Reveal, of course. In this perpetual middle space, I wonder if Kondo teaches us, appropriately, that we must go through the process together, we must make sorting, purging, and tidying a daily habit, and we must do our best to create rituals around these practices characterized by joy and gratitude.